Blocked resources are images, CSS , Java script or any other resource you are using on your website that affect the smooth functioning of your website. Some of this resources affects your webpages or post, which in tend lowers your site visibility on Google and thus your search engine ranking. The introduction of this service in Google webmaster tool had been of great importance as it helps webmasters to get more details on their site health. Another important tool is the ‘’search Appearance’’ feature which suggest what you need to improve on your HTML code. The major problem I have had so far is Duplicated content for my blogger blog. 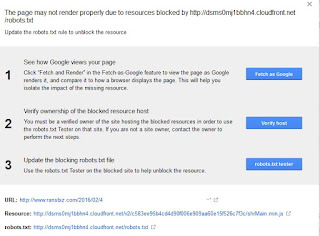 In this post, I will focus on my experience with blocked resources. If you find everything at zero, then your site is ok. Some days back, I login into my Google webmaster account and found out I had a resource that has been blocking my pages from being indexed. I was really worried on how to go about this. I searched for help from the web but the solutions seem beyond my reach and some even beyond my understanding. It was a great joy when I finally sort out what the problem was. This is why I decided to share so that others faced with this problem can get immediate solution. 1. When your find a blocked resource affecting your web pages, use the Fetch as Google option in Google webmaster to submit the URL for indexing. This can be done by clicking on any page that is affected. By using this feature, your URL can be submitted for indexing and you will get the status report some few second after the fetch. 2. 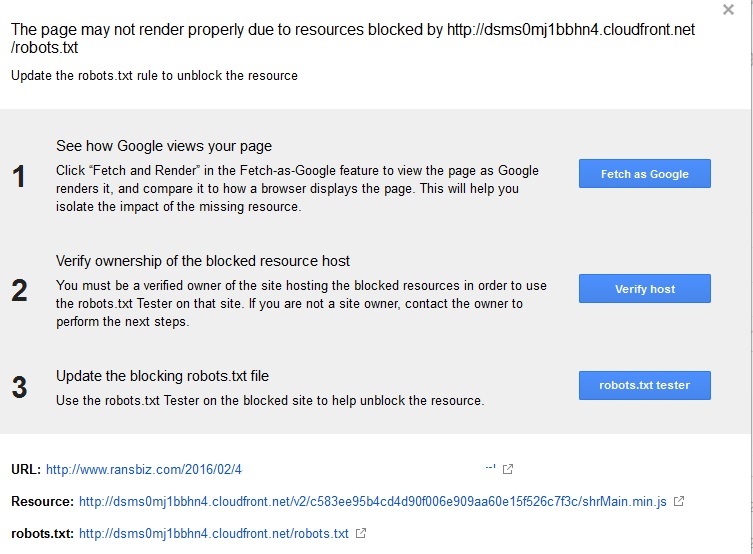 You can verify ownership of the resource if you are used to robot.txt this does not remove the resource but simply enable Google boot to go through your content and make it visible on the web. This option is available on the webmaster tool as seen in the screen shot below. 3. Always use robot.txt to prevent some tool from being indexed. When such resources are crawled unsuccessfully, there are reported as blocked and will affect your site online presence. Robot text can be used to prevent crawling some resources such as track backs on a word press blog. 4. When things look tough, and then consider hiring someone to take care of it. 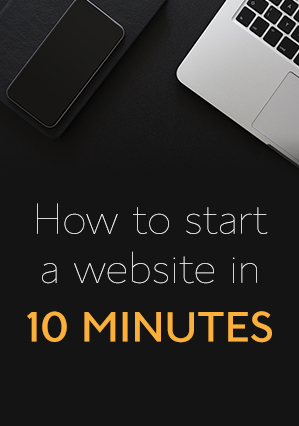 Your website is very important to you and you should do everything to keep it up. I mentioned the suggestions above because some resources that come from external websites are never easy to go by. The best way to go about is by trying any of the methods above if you want to keep your site rocking with some quality traffic from Google search. The first thing I did was that, I used the fetch as Google tool option to submit some of my pages to Google. This helps some of my pages to show up in search results while I was looking for the perfect solution to this problem. Then I took some time to check out every script I’ve added to my website for the past three months. This can be something like word press plugin, share button script, highlighter, HTML script , CSS ,Java script among others. I was able to search for it in my HTML code. It was quite challenging such that I had to check from script to script. Fortunately for me, I was able to find this resource. I removed the script that contained this resource for my site safety, since I had other alternatives and found out real success. You can see the results below.